Archaeology can tell us a lot about the world of first century Palestine, where Jesus lived, and this is a great help in understanding the New Testament. But can it tell us much about one of the most basic questions of all: are the New Testament gospels accurate accounts of Jesus’ life, based on eyewitnesses? It turns out that it can at least tell us something, especially about the gospel of John. John’s gospel claims to be based on the account of an eyewitness to many of the events in the life of Jesus – John, son of Zebedee, a Galilean fisherman who was a close follower of Jesus. It appears to have been edited or assembled by someone else (see John 21:24), so it is impossible to say who should be regarded as the actual author. It is often regarded as the last New Testament book to be written (about 95 CE) and for much of the twentieth century, historical scholars tended to be sceptical about whether it was written from eyewitness accounts, and even whether it was historical at all, having been written so long after the events it describes. But recent archaeological discoveries have suggested that the gospel is indeed based on accurate memories of an eyewitness. The discoveries are detailed by Prof Urban von Walde in a paper “Archeology and John’s Gospel” (in “Jesus and Archaeology” edited by James Charlesworth). John 5:2 mentions a pool with five porticos, named Bethzatha (or Bethesda), and located near a gate in the city wall called the Sheep Gate. For a long time the existence of the pool, and the five porticos was doubted, but the pool, its five porticos and its location near the Sheep Gate have now all been confirmed. John 19:13 describes the Roman Prefect, Pilate, passing judgment on Jesus at a location known as the stone pavement. It appears it has now been discovered – not a stone paved area as originally thought but an area primarily on bedrock. In John 9:1-9 Jesus heals a blind man by telling him to wash in the Pool of Siloam in Jerusalem. The pool has been discovered. 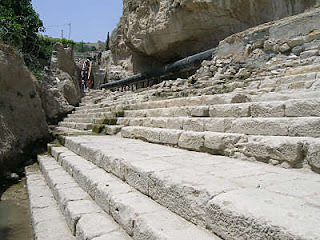 Steps leading down to the Pool of Siloam (photo from BiblePlaces.com). Each of these locations was within the Jerusalem city walls, and would have been destroyed or covered over when the Romans conquered and sacked Jerusalem in 70 CE, yet John’s gospel written after that event still describes them accurately. Von Walde concludes that these and more than a dozen other identified locations show that these references are “accurate, detailed and historical”. This doesn’t prove the accuracy of everything contained in John’s gospel, but it does show that some aspects at least are based on eyewitness accounts. Read more about how historians assess the historicity of the New Testament accounts, and the details of all twenty locations discussed by von Walde.